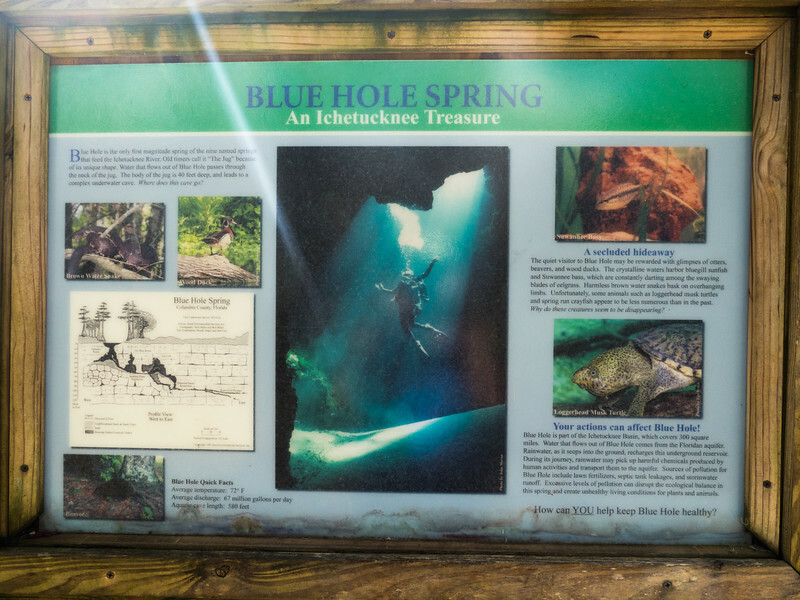 We spent a week at Oleno State Park, but the highlight of our week was actually a few miles away at Ichetucknee Springs State park. 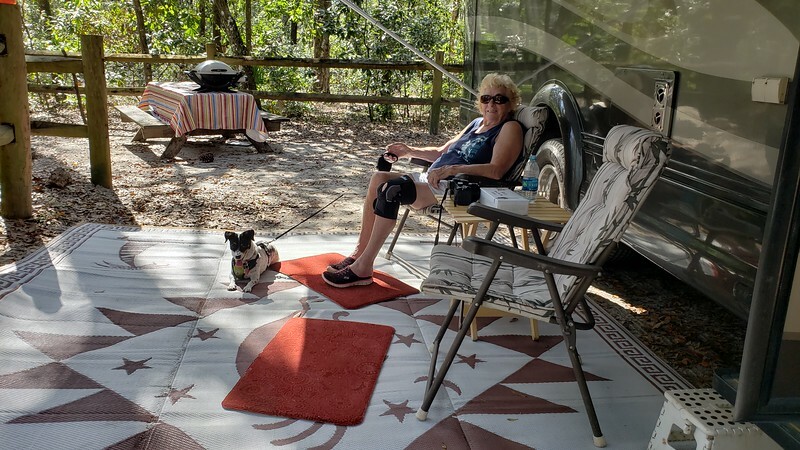 There is no state park campground at Ichetucknee Springs, and when planning this trip I decided that Oleno State Park would be a good place for us to explore the area and plan for a day on the Ichetucknee River. 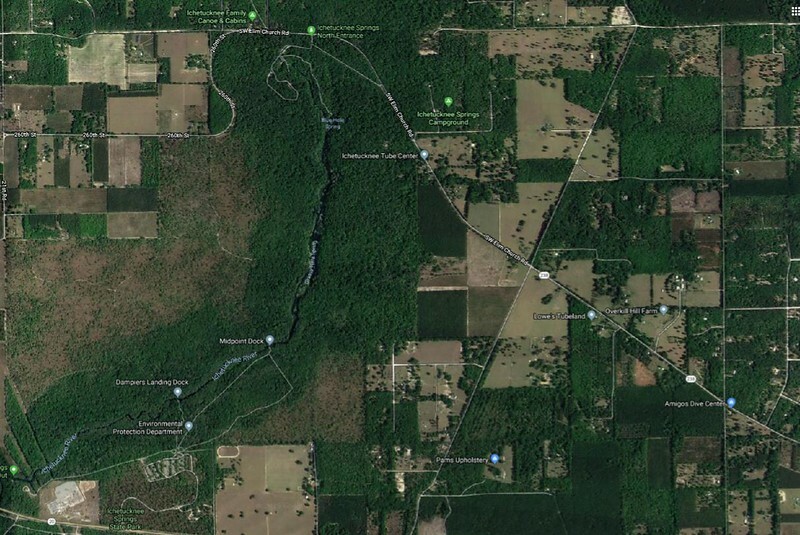 One afternoon we made the drive from Oleno to Ichetucknee to check out the area and go for a swim in the famous Ichetucknee Spring. It was hot and sunny, but with Mo’s knee still giving her trouble we decided to save our kayak day for later in the week. 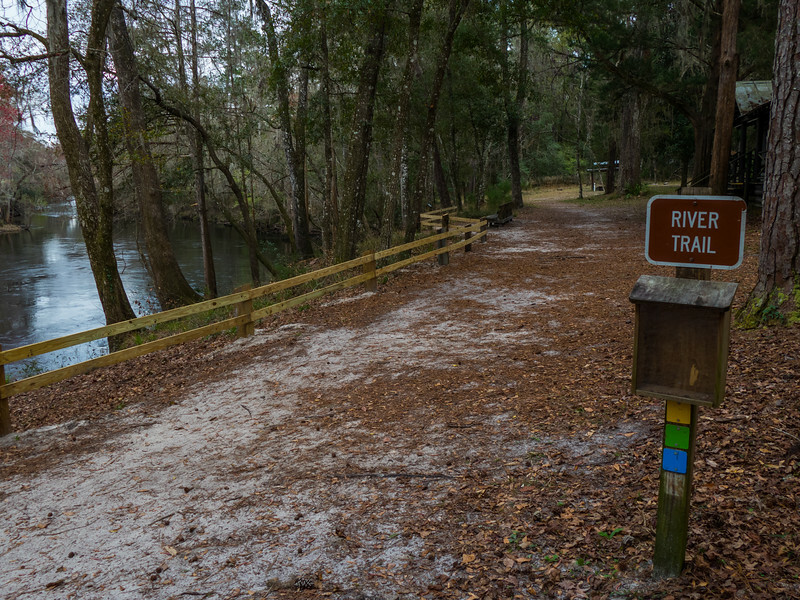 An interesting feature we noticed was a wonderful paved bike trail that passed Oleno State Park, through the tiny town of Fort White, and continued all the way to Ichetucknee Springs State Park. Made us wish we had brought the bikes on this trip after all. We found the headwaters of the spring, which was in a bit of turmoil due to construction and upgrades to the park infrastructure. 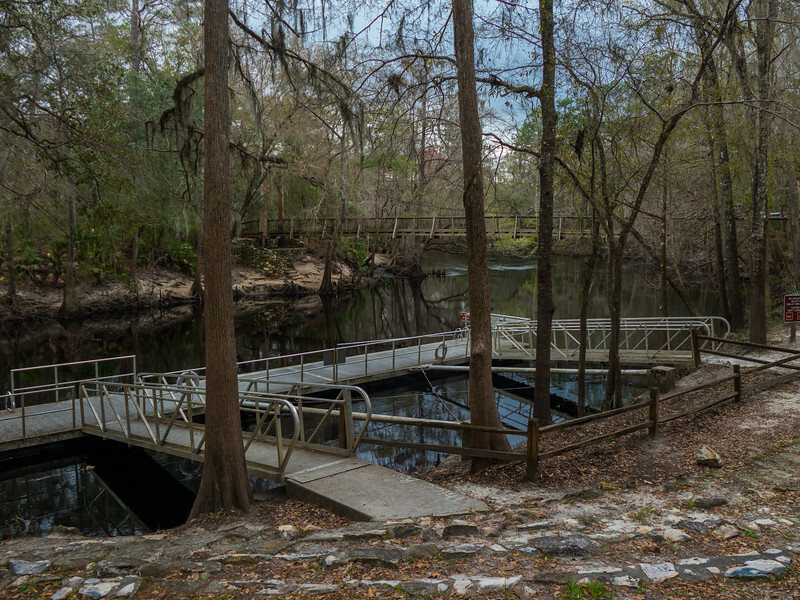 It was just a short walk from parking to the spring area and the cool waters of the spring were a perfect antidote to a hot, somewhat muggy day. 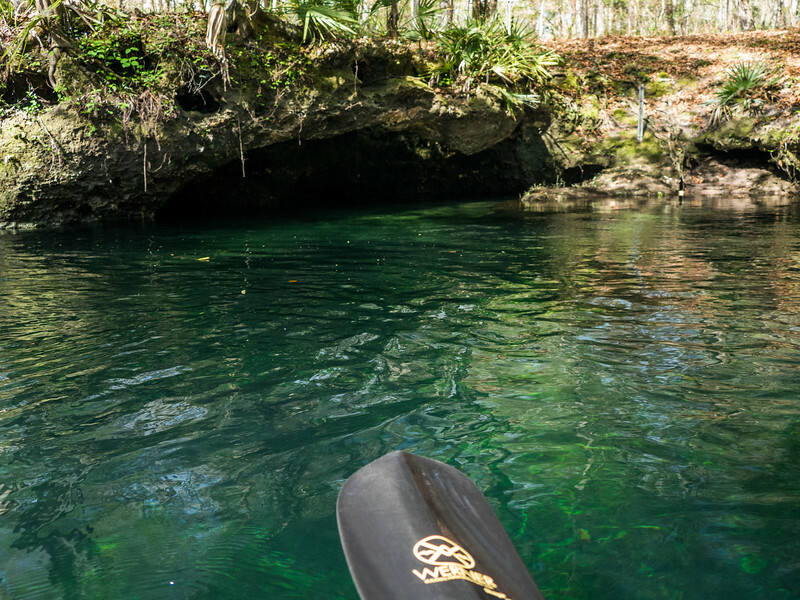 I managed to get over the first shock of the 72 degree water and within minutes was enjoying the rushing feel of swimming directly over the “boil”, the place where the crystal clear water emerges from the limestone cave below. 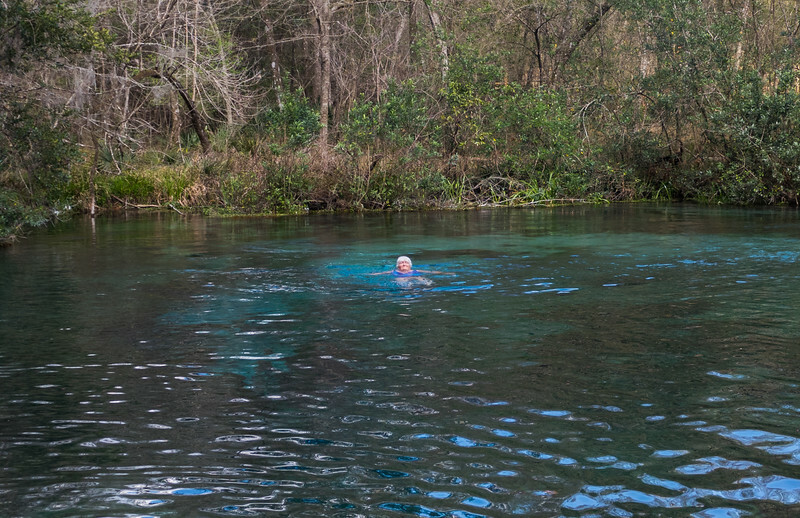 After I had my fill of swimming, Mo relaxed by the spring while I hiked the half mile along the river to another famous spot on the Ichetucknee, The Blue Hole. This underwater cave is especially popular with divers, and sure enough, there were divers at the hole coming and going. 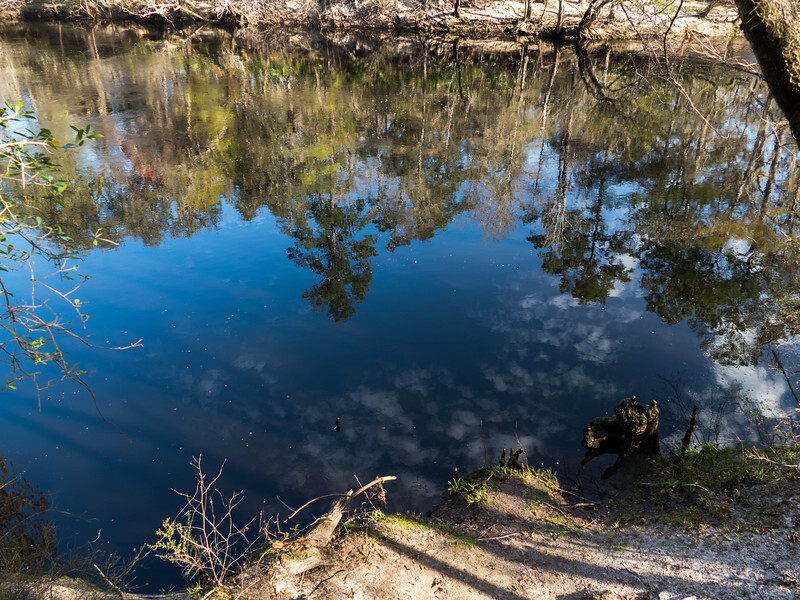 The Blue Hole is much smaller than the main spring, and darker. I could barely see where the water emerged among all the dark green river grass. 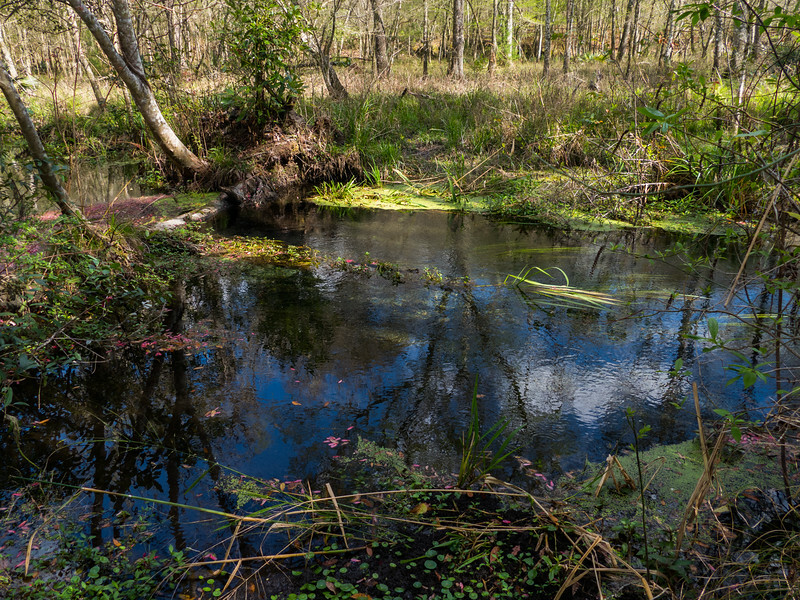 The Ichetucknee is a spring-fed, pristine river. 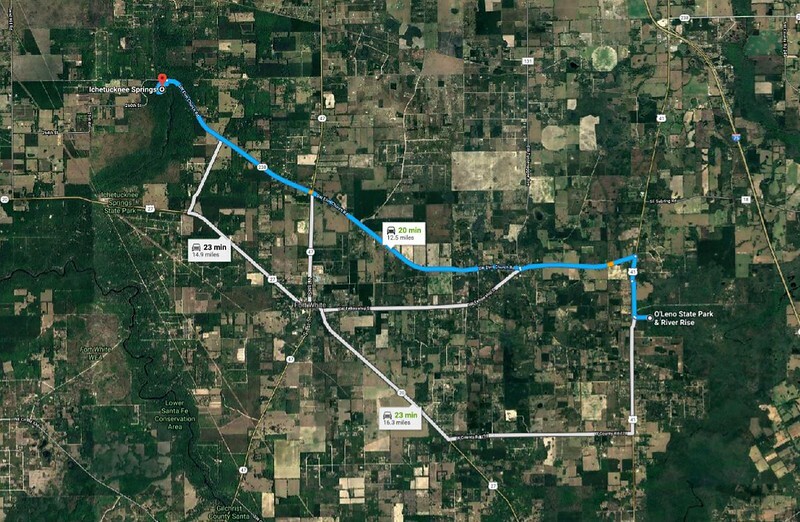 Most of its 6 mile length are within the state park, but couple of miles are south of Highway 27 and there are houses on that portion of the river as is flows into the Santa Fe River. The water in the river is crystal-clear and is 72 °F (22 °C) year-round. 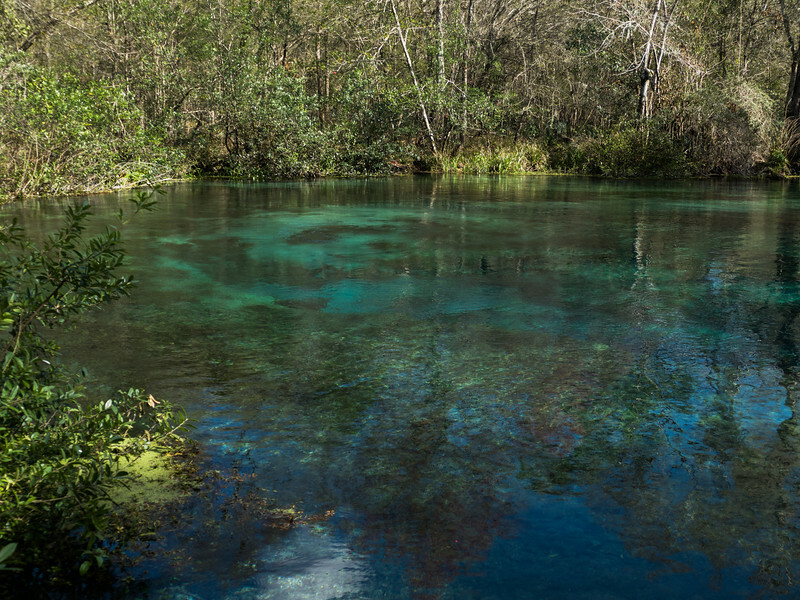 There are nine named springs within the Ichetucknee Springs group with an average total flow of 212 million gallons per day. 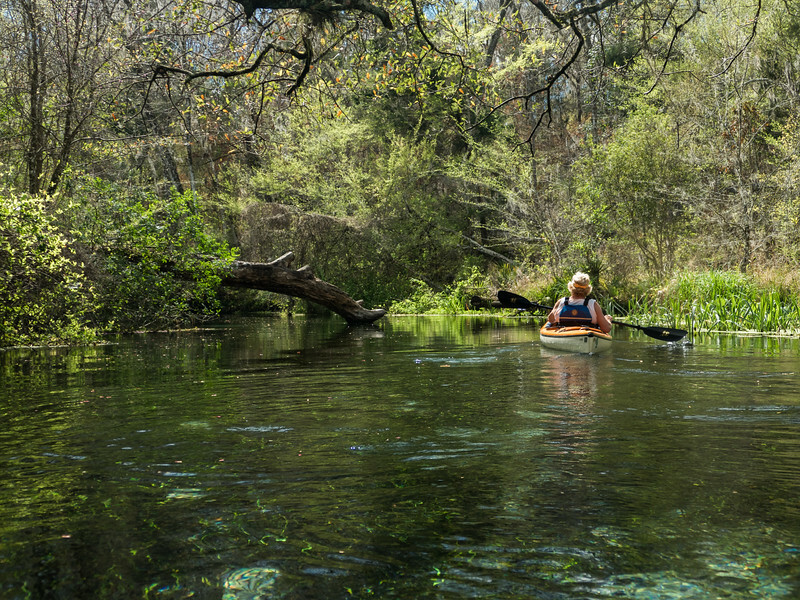 The group includes: Ichetucknee Springs, Cedar Head Spring, Blue Hole Spring, Roaring Springs, Singing Springs, Boiling Spring, Grassy Hole Springs, Mill Pond Spring, and Coffee Spring. 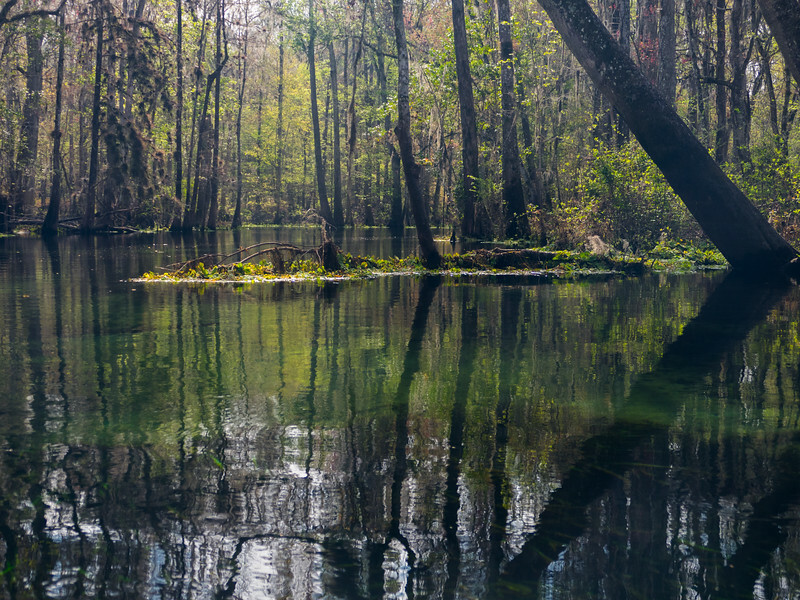 The Ichetucknee is a tributary of the Santa Fe River, which in turn flows into the Suwannee River before emptying into the Gulf of Mexico. By Saturday Mo was ready to tackle sitting in the kayak for the length of the river. 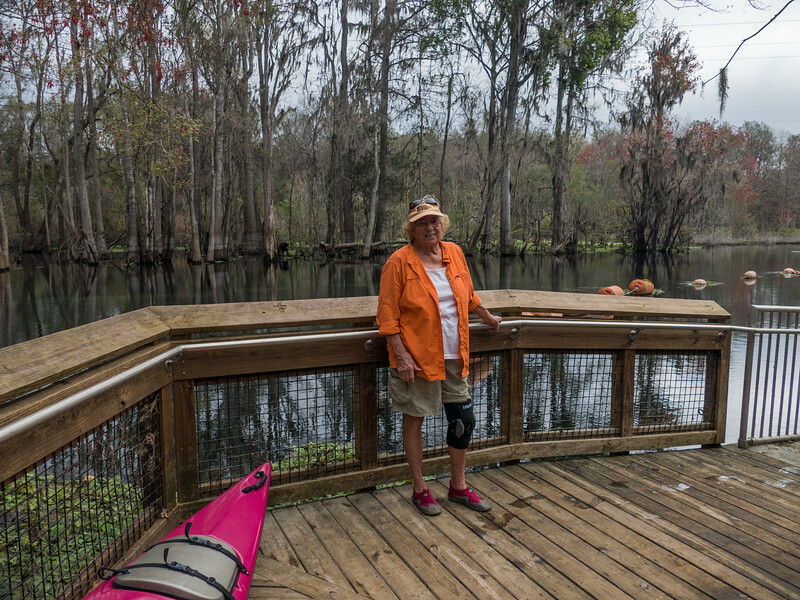 She wasn’t about to miss this beautiful water, and what we knew would be one of the best rivers in Florida. We followed the directions given to us by Laurel and Eric who say this is one of their most favorite rivers. Parking on the south side of the park, just east of the Highway 27 bridge costs just $6.00. There is a loading zone, and a short walk down to an incredibly easy launch site, with railings, a non slippery board walk and steps leading directly into the river. 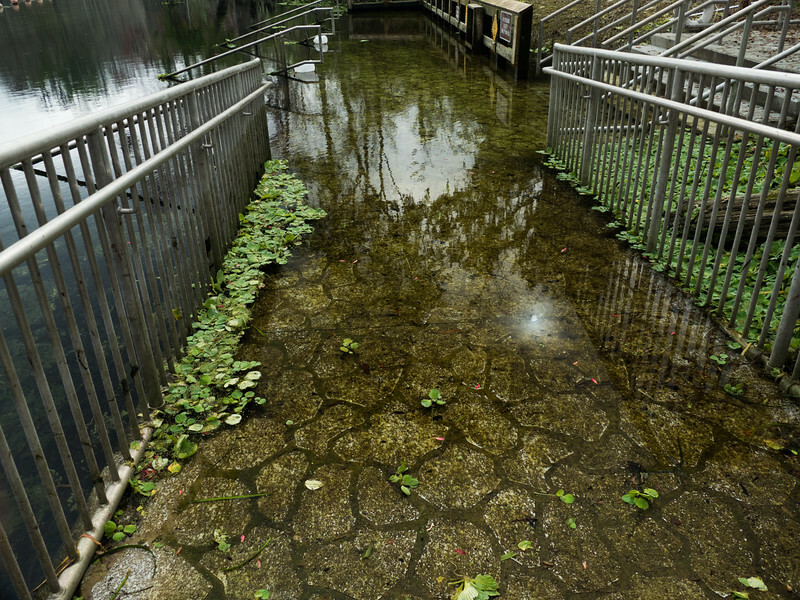 The water was fairly high, so much of the launch boardwalk was inundated. We knew we had approximated 4 hours of kayaking ahead of us, and both agreed if Mo’s leg started acting up too much we could simply turn around. Happy to say that wasn’t needed and we kayaked as far as we could go to the headwaters and the official upriver launching site. We chose not to try to get in and out of the boats at that point, and simply turned around for the easy glide downstream. By leaving early in the morning, paddling upstream from the lower launch site, we had the river almost entirely to ourselves. Most people chose to launch at the headwaters and paddle downstream, and there are companies that will do a shuttle for a fee. The current was strong and the river was high according to some folks we talked to, but paddling upstream wasn’t difficult in the least. The warm day brought out the tubers and the paddleboarders as well, and even though tubing isn’t technically allowed on the river until after Memorial Day, we passed many folks lounging on tubes going downriver. The closer we got to the headspring, the more people we encountered, and when we turned around, we were among all those folks just idly sliding downstream thoroughly enjoying the crystal clear water, and the beautiful cypress forest. The best part of the paddle happened just a short time after we launched. 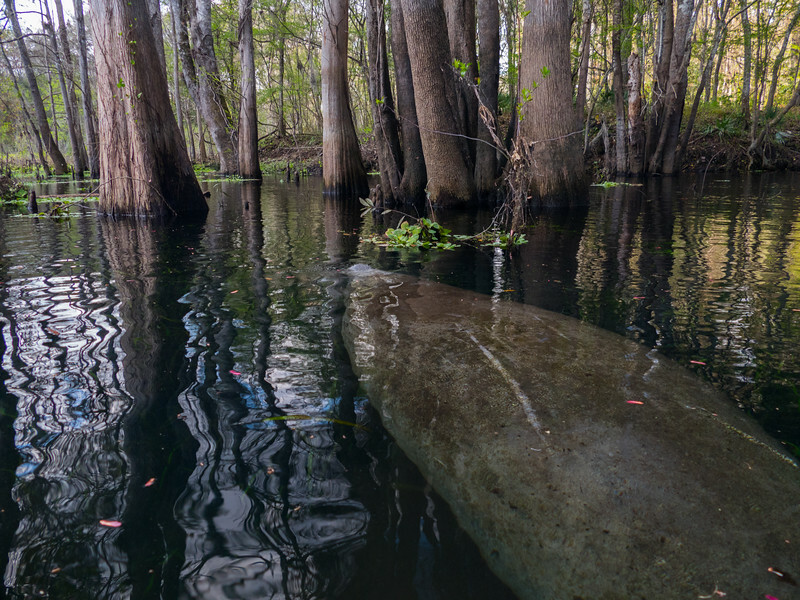 In a calm wide spot on the river, only a few hundred yards from the launch site Mo saw three manatees swimming beneath her boat. It was a thrilling moment, and the big gentle creatures swam slowly around us and below us, ever so gently, rising every few minutes to take a breath of air. That soft whoosh of their breathing is such a sweet sound, and then watching them sink back gently to the river bottom to graze is somehow calming. I loved floating around with them, but we still had the entire river to kayak, so we left them to the grassy meal and continued on our way. 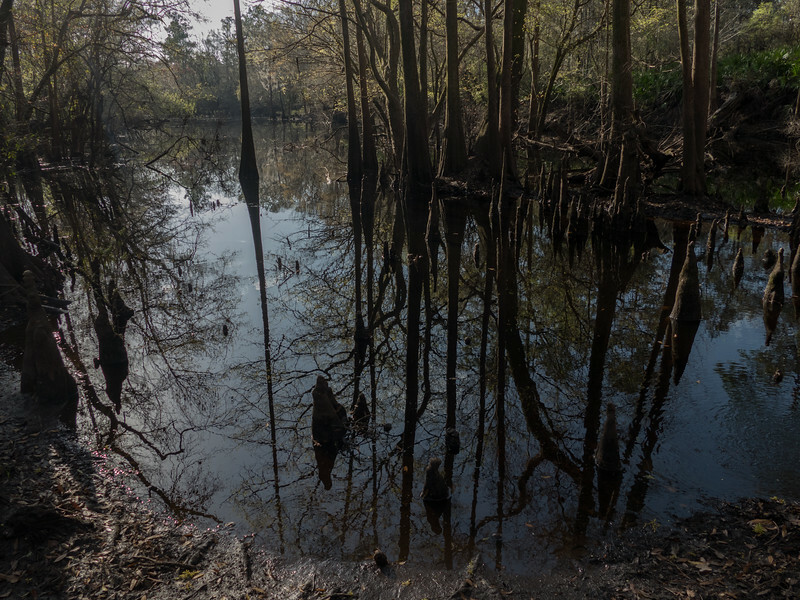 The river flows almost entirely through cypress swampland, and when we started everything was a bit gray and dingy. As the sun filtered through the morning fog and clouds it illuminated the tiny cypress and maple leaves that were just starting to pop with spring color. It was a beautiful morning on the river, and took us just about 4 hours to paddle upstream and back down. Mo managed to get in and out of the boat without incident, and her knee was no worse for wear after the paddle than it would have been anyway. Which isn’t exactly good, but the river trip didn’t make it any worse, and we had a wonderful day. Is it really possible to post a blog with photos from the blogger platform from a phone!! 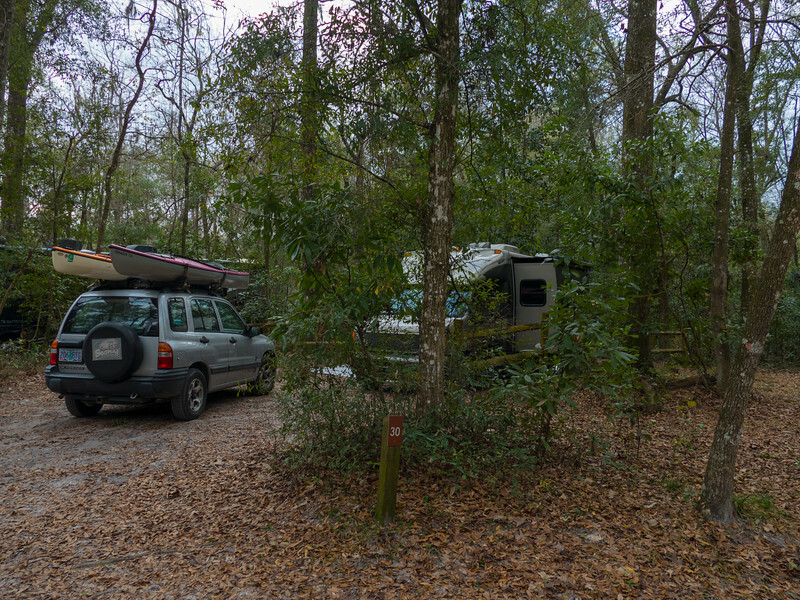 The first few days of our stay at Oleno State Park were fairly quiet. 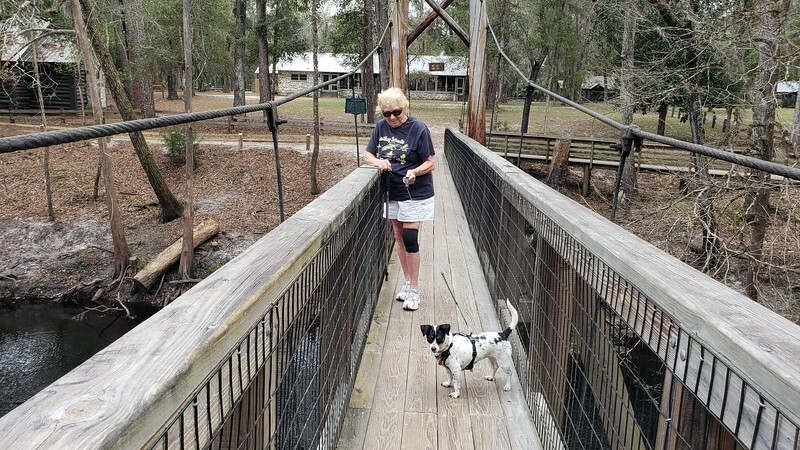 Mo rested her leg and I took Mattie for several hikes around the park trails that I wrote about in the previous post. 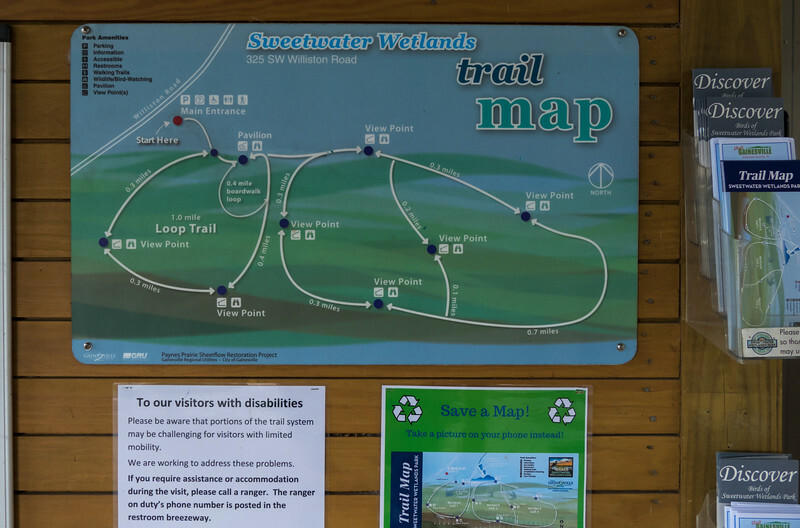 Wish I had recorded the cacophony of bird song as I walked this trail at Sweetwater. Once good thing about down time, is that it gave Mo a chance to communicate with her tax person and get some of that complex stuff taken care of. In the event that we aren’t home by tax time, it is good to get it all handled with email. Mo actually purchased a small Canon printer for our travels, but what we didn’t think about is that it doesn’t have the capacity to copy or scan documents. With a lot of paperwork that needed copying before being sent back to the tax person in Oregon, we needed access to some kind of office store. Hence a trip to Gainesville. 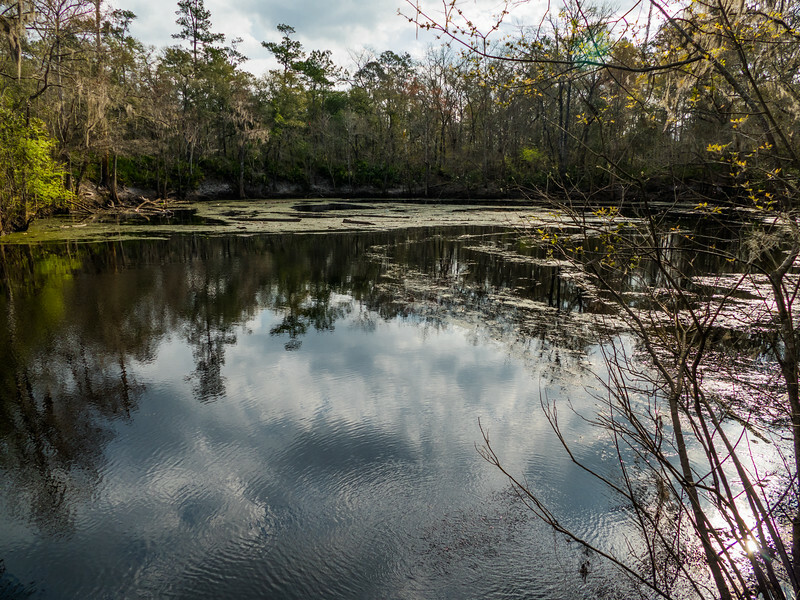 I searched for a time in nearby High Springs without any results, and we didn’t really want to drive farther north, so we piled into the Tracker for the trip east toward the city and the closest office supply store with a copying facility that I could find. It was another pretty drive through open countryside. I have said this over and over, but the best part about traveling in northern Florida are the quiet empty roads. Until we got close to Gainesville, that is. Once we approached I-75 the traffic picked up and the 3 lanes on each side of our highway were filled with people going in and out of the big malls. I looked wistfully at the Dillard’s store, a place I used to love to shop when visiting Florida, but we were on a mission, and it was too hot to leave Mo alone in the car while I “wish-shopped”. I rarely ever buy anything when shopping those big department stores. We found the Office Max easily, parked right in front, and in a matter of minutes had all the papers copied and sent off in a Priority Mail envelope from right there in the store. Easy stuff, and under two bucks for all the copies. A lot cheaper and easier than hauling around a printer big enough to scan or copy. Looking around for things to do since we were in Gainesville, the choices that didn’t involve walking that interested us were few. 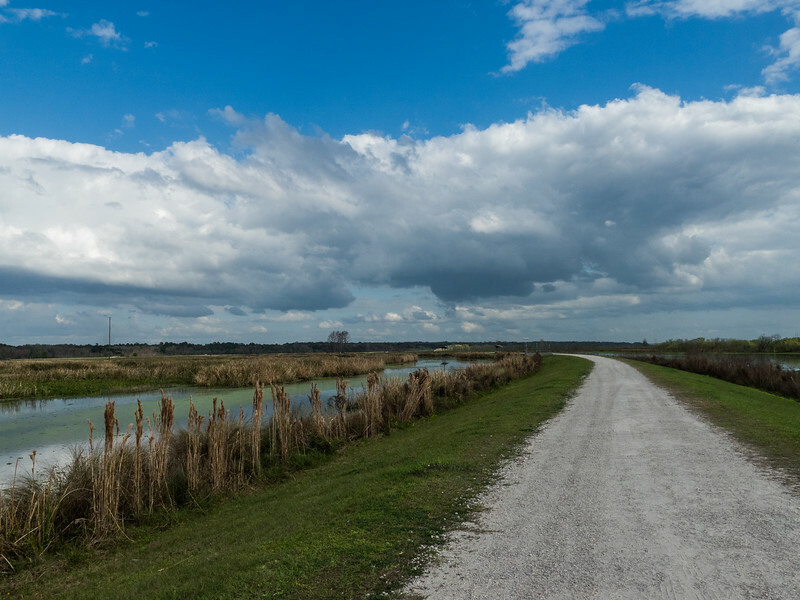 I have visited Paynes Prairie in the past, and loved it, but getting to the entrance required a considerable drive around the prairie to the south. We also loved visiting Micanopy on our trip here in 2014 and by myself in 2011 (here), but it was a drive in a different direction, and walking around the sweet little town looking for cute shops and ice cream was also not too high on Mo’s list for the afternoon. Instead, she said, “Do something you want to do and I’ll wait in the car.. 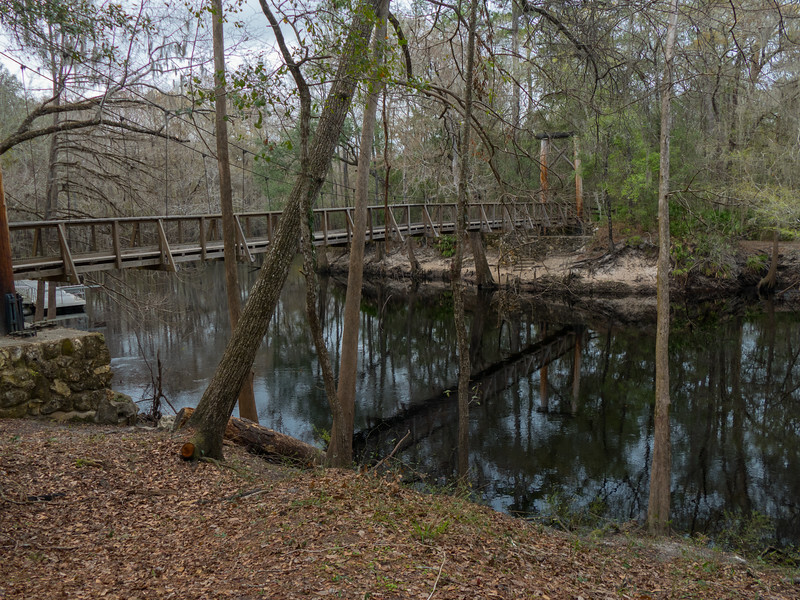 I had read about the Sweetwater Preserve in the “best things to do in Gainesville”, so we headed east toward the University of Florida, enjoying the narrow streets and university vibe and then continued south toward the Sweetwater Preserve. 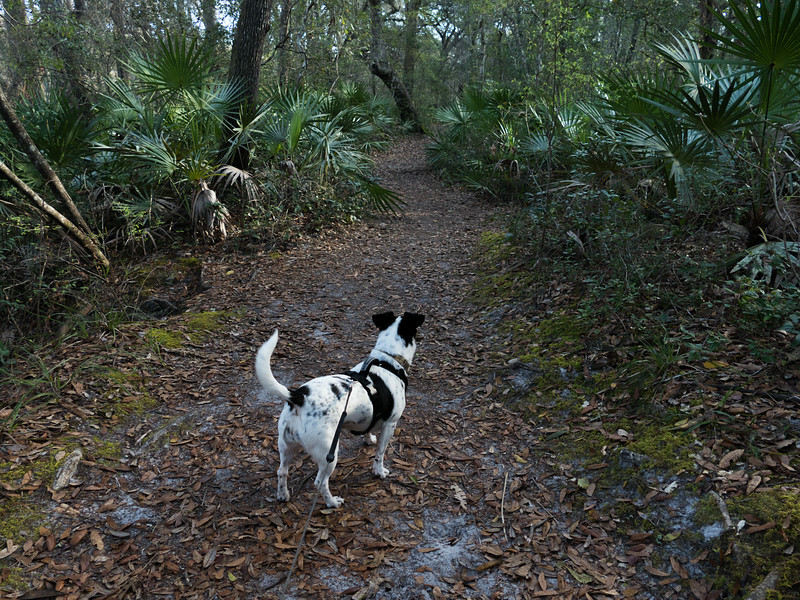 We knew that the dog couldn’t go on the trails, but since Mo also couldn’t go on the trails, that wasn’t a problem. The day was warming up, though, so I was happy to find a nice breezy shelter at the entrance to the preserve where Mo could sit with the dog if waiting at the car got to be too much. Camera in hand, I headed for the trails. 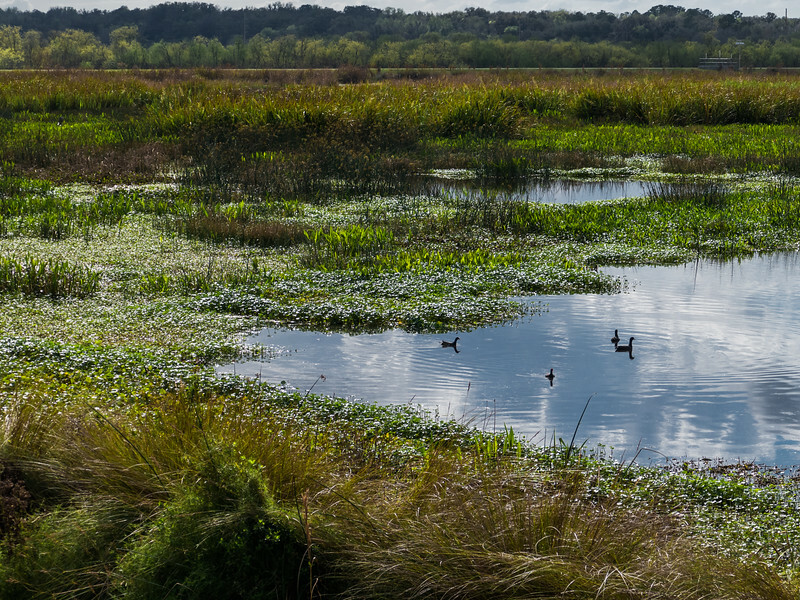 Sweetwater Wetlands Park is an excellent example of what a city can do if it is committed to clean water and to preserving a treasure like Paynes Prairie. 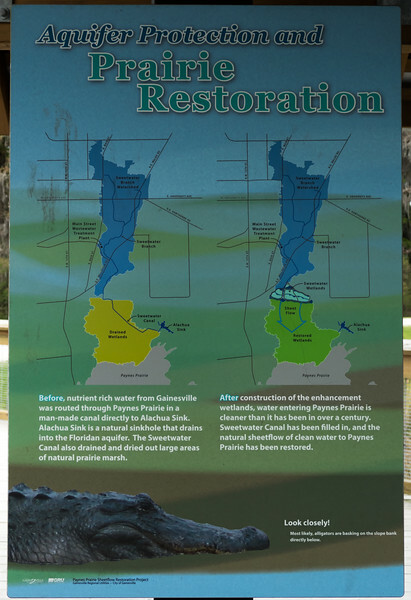 The park, which consists of more than 125 acres of wetlands and ponds, was created to improve the water quality of wetlands in Paynes Prairie and the Floridan Aquifer. 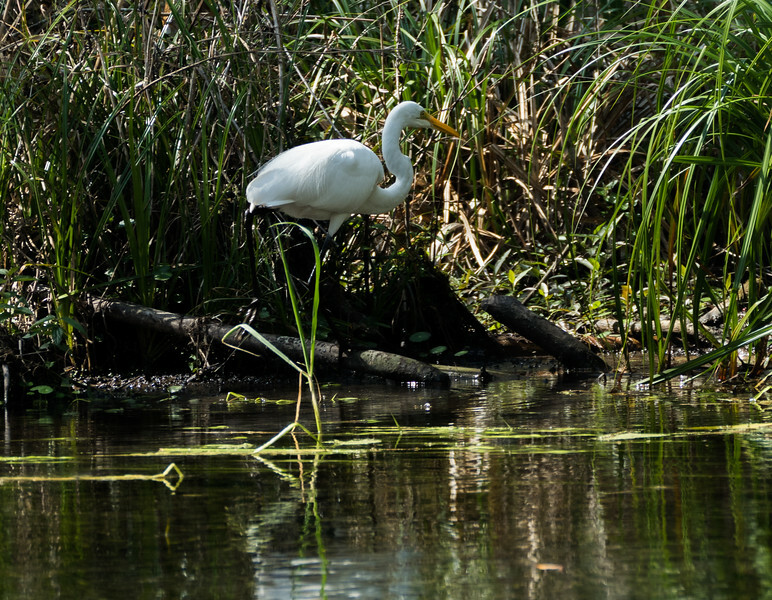 Now a thriving habitat, Sweetwater Wetlands Park is filled with vast numbers of plants and animals, including birds, butterflies, alligators and Florida cracker horses. 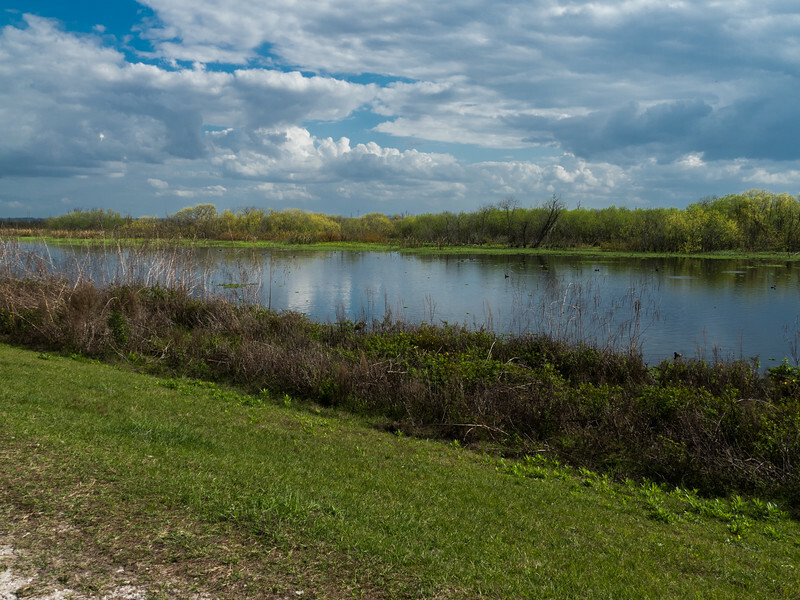 At the park, you can walk more than 3.5 miles of crushed gravel trails and boardwalks, experience the lush landscape from viewing platforms, and learn about the habitat through educational signs and tours. An extra benefit that I talked about with a walker I encountered, was the elevated level of the pathways. 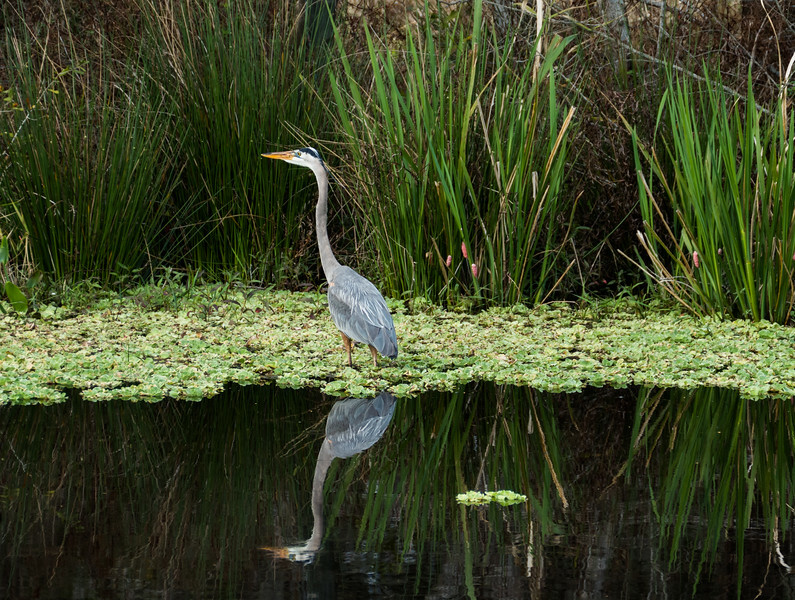 He said no matter the weather, no matter the flooding, one can always walk the wetland trails to view the wildlife. There were bikers and walkers, and several people with cameras taking photos of the birds, although the trails never felt crowded. 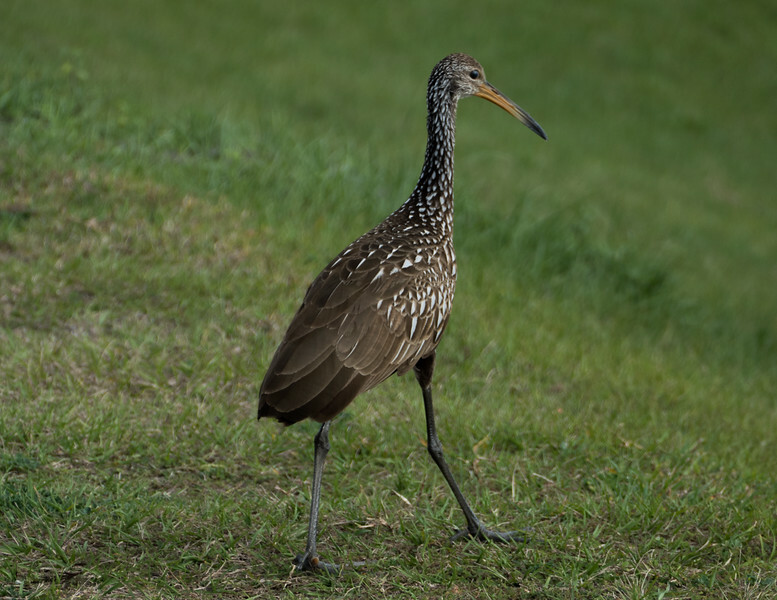 I saw a bird I have never previously encountered, the limpkin. 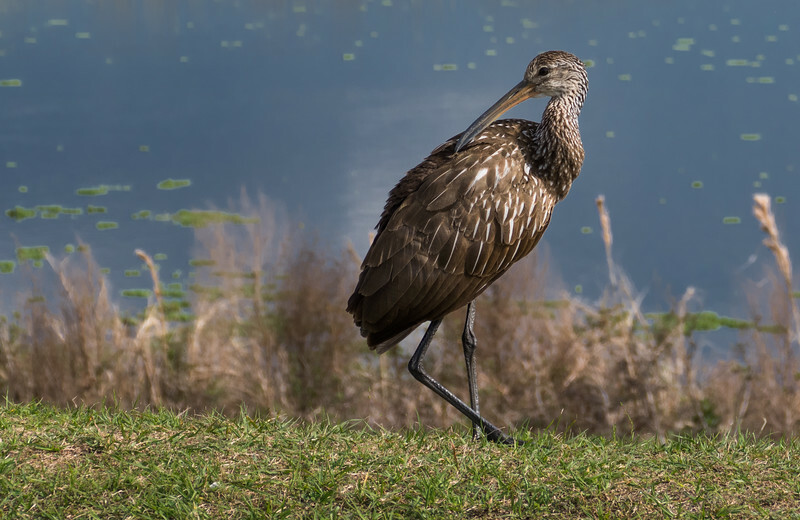 This bird is endemic to only this southern part of the country and parts of the Caribbean. 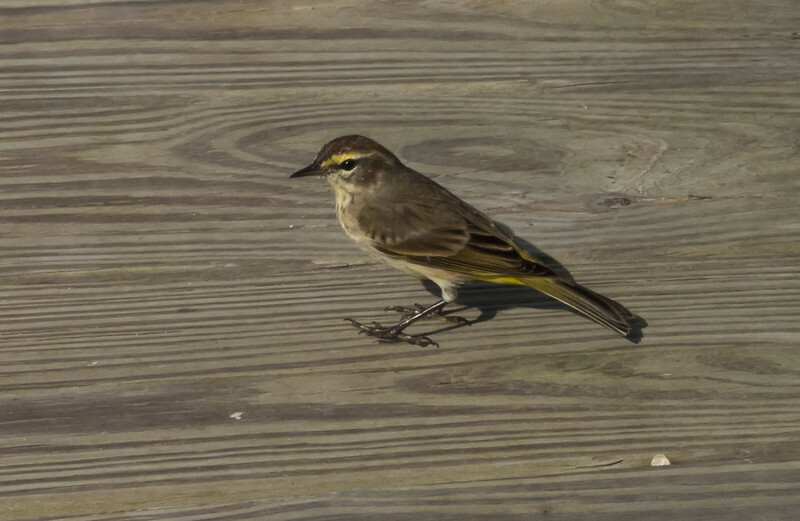 They were amazingly curious, and unafraid, letting me approach more closely than many birds I have seen in the wild. 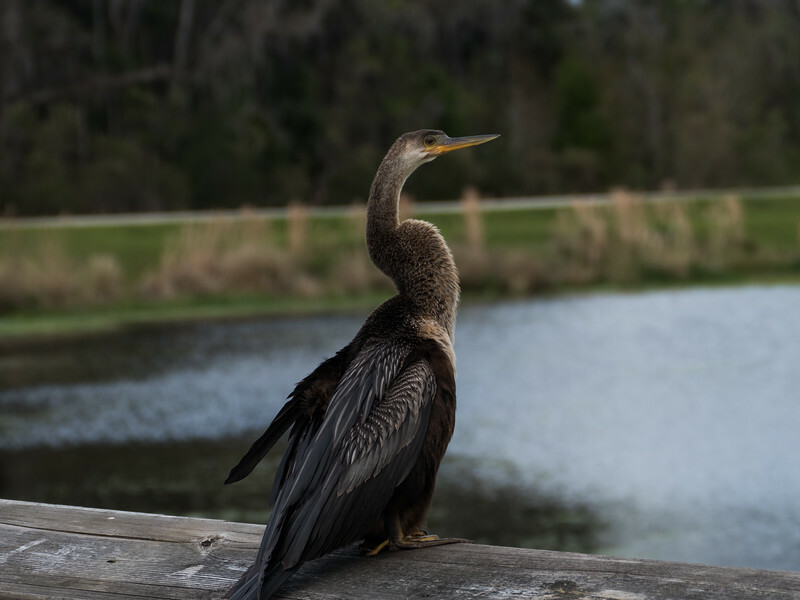 I only walked the short loop, about a mile and a half, and took my time photographing the birds and the one lone alligator lying in the grass. 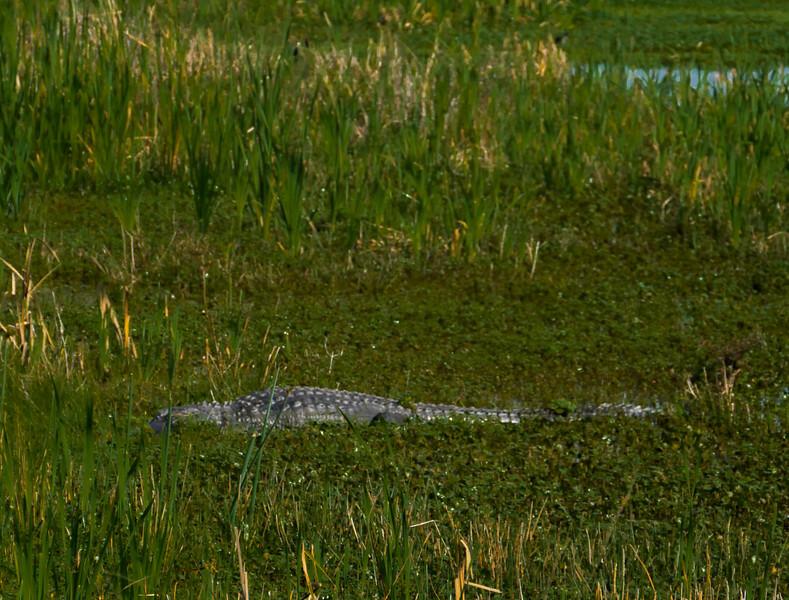 First and only alligator I have seen so far on this trip to Florida, but I have heard that perhaps there will be more when we walk the wetland boardwalks at NAS Jacksonville where we will be camped from March 3 to March 10. We ended the day with BLT’s at the Diner in High Springs. Fun to look at on the outside, and a typical sandwich, burger kind of place on the inside. It seemed quite popular with the locals. Currently, where I sit at Mayport, the rain is coming down harder and harder, and even the thought of a drive down A1A toward Jacksonville Beach doesn’t sound very appealing. As I write and add photographs, I am especially appreciative of the lovely, warm and sunny days that we have had in the midst of some days that have been not quite so nice. Ah, weather, but then again we could be home in snowy Oregon, where photos of record snows and weather warnings about low temperatures are a daily occurrence. I’m glad we are here. When we first arrived at Oleno, the park seemed quite confusing. The entry station is a couple of miles from the campground, and I received no maps or information about the park from the ranger when we checked in. I discovered later it was because they were temporarily out of maps, but that didn’t help much that first day. 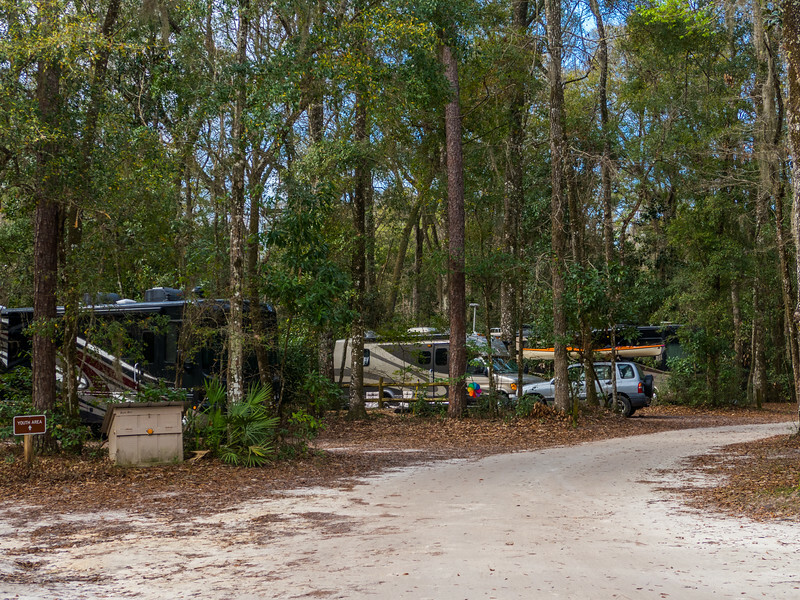 As is often the case with state parks, they are busy and full on the weekends, with young families, kids, dogs, and people coming and going often. We are in site number 30, toward the end of the loop in the Magnolia campground. I think these sites must be for short-timers, because our neighbors on both sides have changed on almost a daily basis. After breakfast on our first morning here, I left Mattie with Mo and decided to try to get the lay of the land a bit on foot. I left the phone with Mo so that she could have the hotspot for internet and took off down the road on the still cool, overcast morning. Without a phone OR a map, I was left to my own devices to figure things out. I did manage to find the main parking lot, and wandered down toward the river. 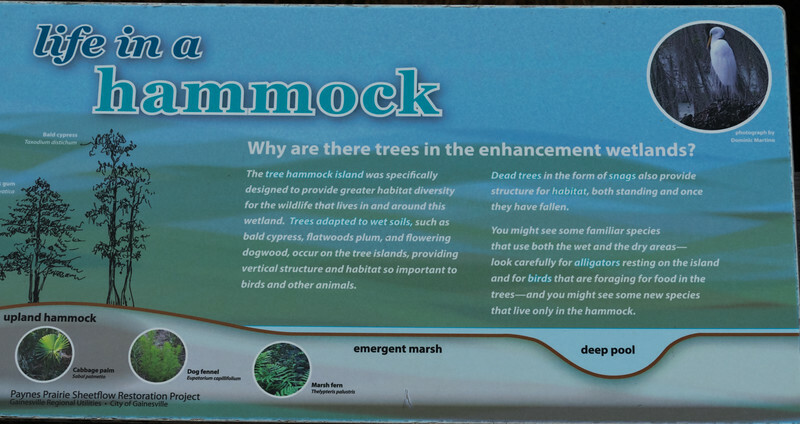 There are some interpretive signs about that helped a bit. Oleno is named for the town that once existed here, called Leno. However that name was changed from the original name of Keno, since some of the later religious inhabitants didn’t think naming a town for a gambling game was a good idea. The original town was eventually abandoned when the railroad chose to bypass the town in favor of other routes. 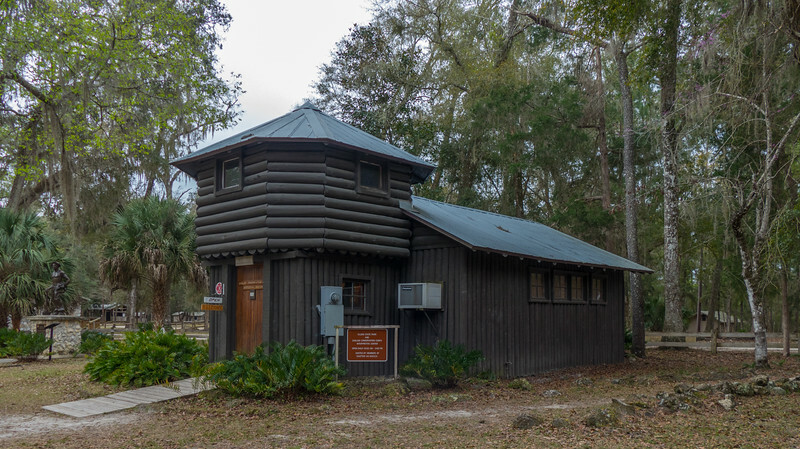 The park also is the location of a CCC training camp, and there is a sweet little museum on the premises with many original photos of the CCC workers, and stories of all they accomplished. Every time I read about what FDR did with the CCC I am saddened that the same idea can’t be implemented in our country again. They did so much, and so many young men were saved from a life of poverty, and in the process our infrastructure was enriched. 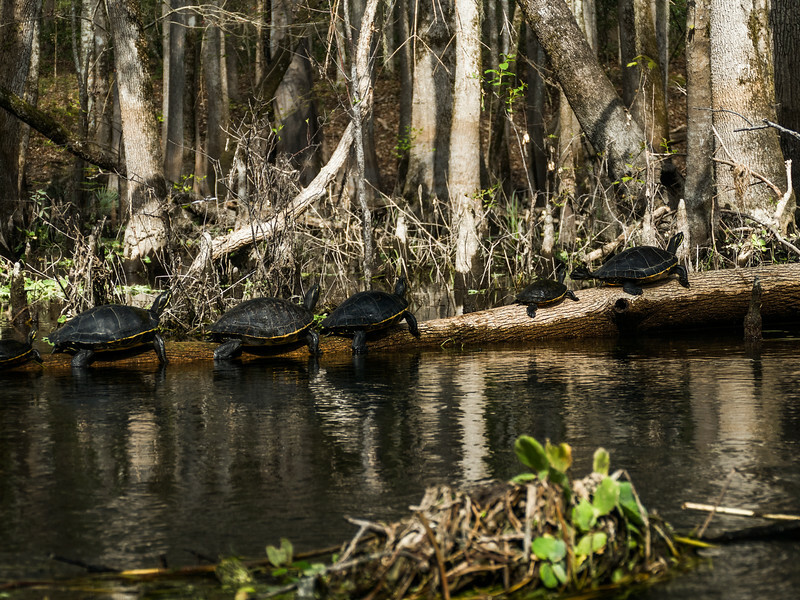 The natural history of the land here is even more fascinating than that of the town. 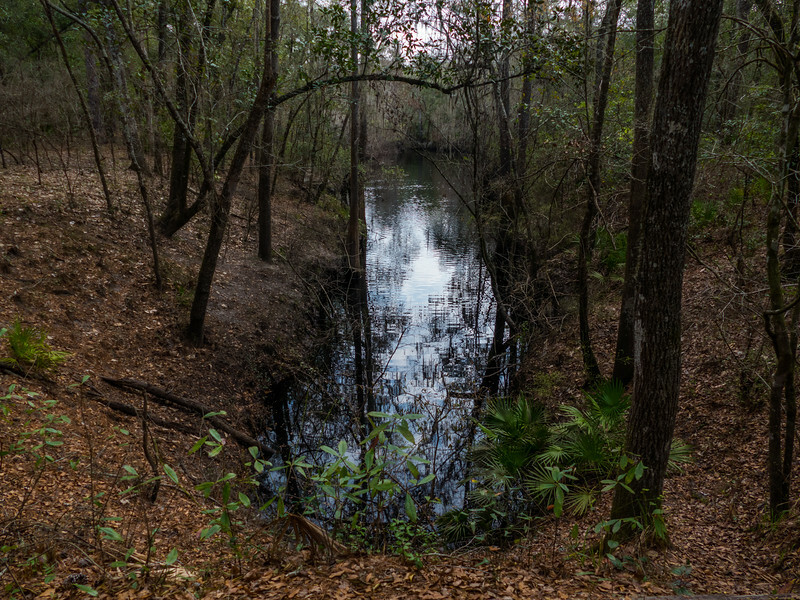 The Santa Fe River, spring fed for 76 miles from Putnam County into the Suwannee, disappears into the limestone bedrock and an underground channel at the River Sink here in the park, and rises again a full blown river at River Rise Preserve just 3 miles south. On that first morning, I was having a hard time appreciating the river and the trail. The skies were gray, the trees were mostly gray because the leaves hadn’t yet popped, and the river was inky black. Still, the trails were quite nice, even without a map, there at least are yellow blazes to mark the River Trail and I found my way to the sink, and then continued on around the mile and a half loop back to the lovely swinging bridge, also built by the CCC. As the days have passed, and I have walked the River Trail and others in the park, I have come to appreciate the landscape more and more. It helps that we have had a few sunny days, and that the tiny spring leaves are popping brilliant chartreuse in the sunlight. 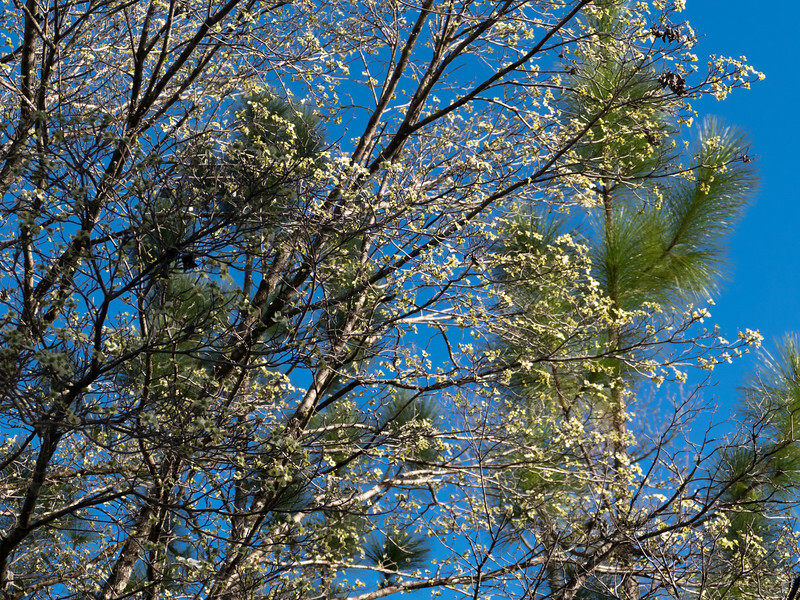 The long leaf pine forest is alive with birds, even though most of them are hidden and only heard. 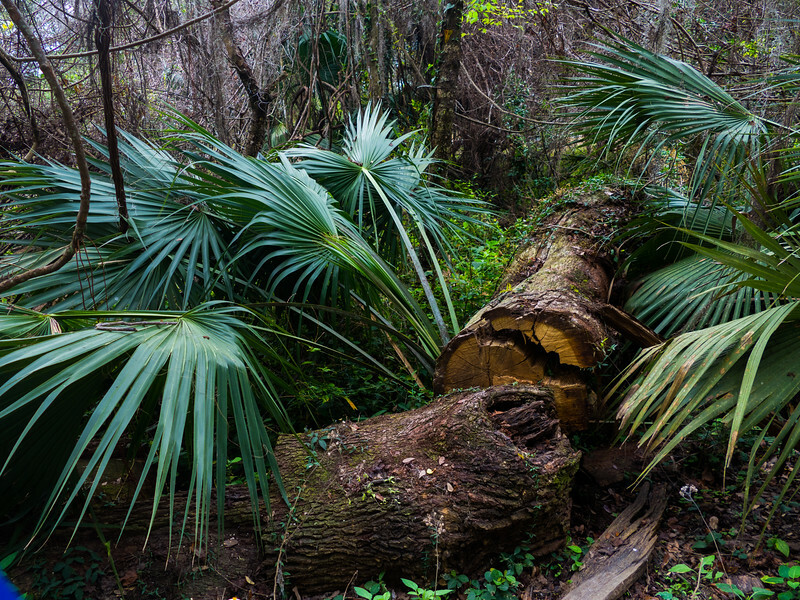 The palmetto understory is thick and green, and after passing the sink and walking along the land bridge hiding the river beneath me, there are many dark sinkholes and wet spots. It really is kind of a spooky place, actually. I have to laugh, because this same river trail just freaks Mattie out completely. It isn’t a landscape that she is used to and she jumps at every shadow and dark stump that is waiting to get her. 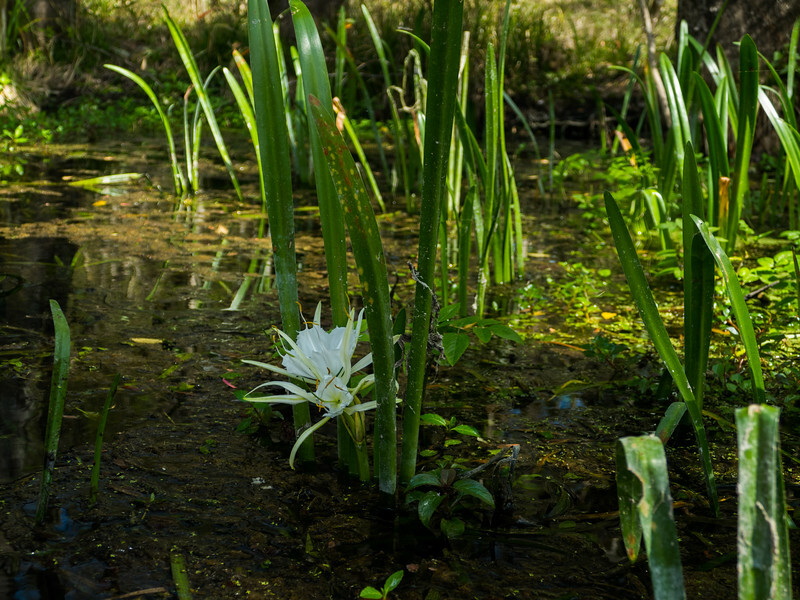 There are snakes, but we haven’t seen even one, and nary a single alligator in any of the low spots along the river. 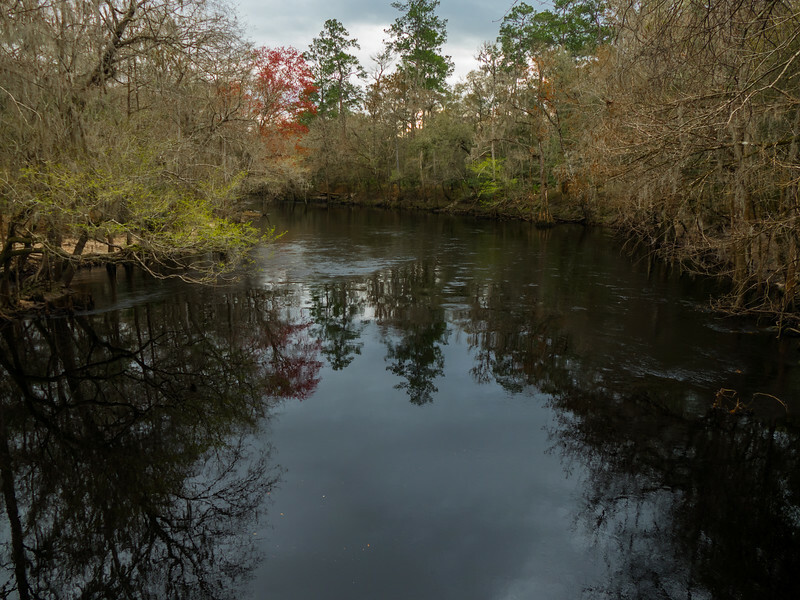 Speaking of the river, the Santa Fe is my first experience with what is called a blackwater river. The water is described as tea colored, naturally stained from organic materials, but I would say it is more like black strong coffee. 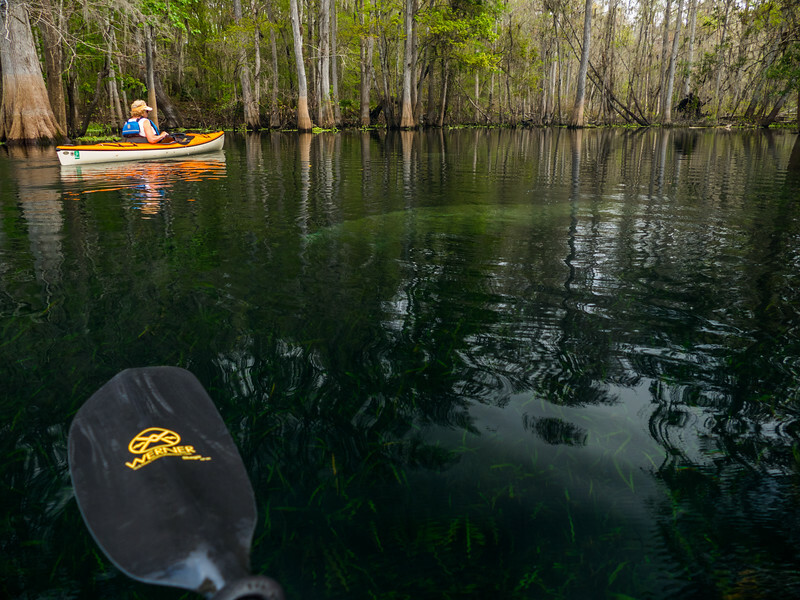 We originally thought we might kayak the Santa Fe, but that inky water spooks me as much as those inky stumps spook Mattie! It looks ever so much like thick black ink flowing past me, and the current at this time is quite strong. I can’t imagine not being able to see a root or a log that hides below that shiny black surface. One steamy afternoon, Mo and I walked down to the boat launch area on the river and thought we would put our feet in the water just to cool off. That water was so spooky I could barely put my feet in it, much less any of my body. No way! The muddy banks thick with cypress knees don’t make the river all that inviting, and the evening no-see-ums, and the see-ums, and a few mosquitoes didn’t help. We didn’t stay long, but it was a chance for Mo to walk a little bit, see the bridge and visit the CCC museum. I have wandered off along several trails to discover that I was wandering off into basically nowhere, and it is really easy to get lost in this forest, especially on a cloudy day. Again, no phone, no map, no GPS, just me and the dog and our spooky instincts to guide us. Having worked in the woods for so many decades helps a bit, and I am pretty good at navigating out west, but here in the flat east my sense of direction is a bit wonky. I was delighted yesterday afternoon when there was some bright sunshine to help give me a sense of place as I explored one more new trail. We have had a pleasant week here at Oleno. Our neighbors have been mostly quiet, and without spooky dogs, except for this last couple who landed yesterday with their big dogs and no leashes. I pick up Mattie as I approach the MoHo and so far so good, those dogs haven’t tried to come over here, but they do bark, and they have big barks. 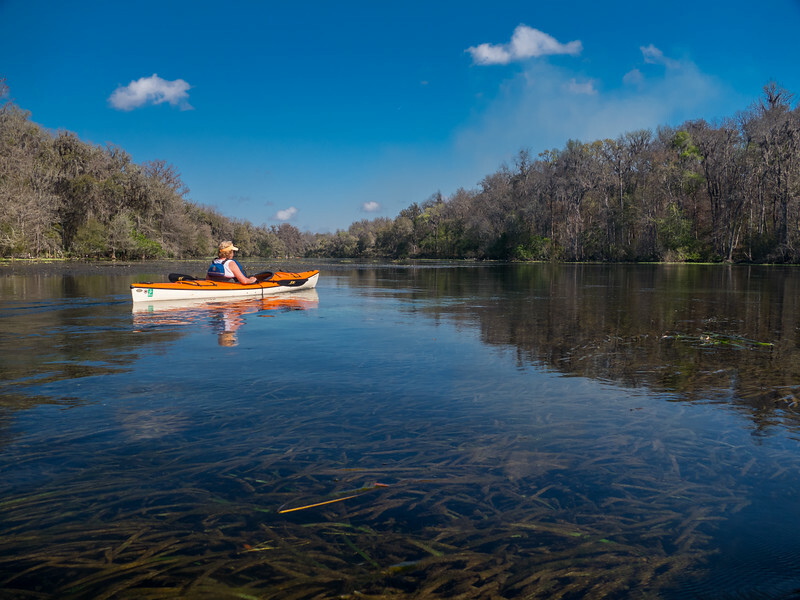 Next up: a drive to Gainesville for an interesting afternoon at the Sweetwater Wetland Preserve, enjoying supper at the Diner in High Springs, swimming on a hot afternoon at Ichetucknee Springs, and of course, the highlight of the week, kayaking the Ichetucknee River. I have no photos to go with the words that follow. As you read, you will understand why. Instead, I’ll just add a few random photos to let you know that all is almost well now, 6 days later. When we went to bed on Sunday night, we were both happy that Mo’s knee injury had been just a momentary blip, and everything seemed to be fine. It didn’t stay fine. Sometime in the middle of the night, Mo turned in her sleep and somehow her knee was once again in horrible pain. She couldn’t stand or walk and nothing seemed to help. We waited, hoping that maybe it would go away as it had the previous day on the river, but no such luck. Her knee began to swell, and was hot to the touch. By morning, we knew we needed to get her to a doctor, but weren’t sure exactly how to go about doing that. 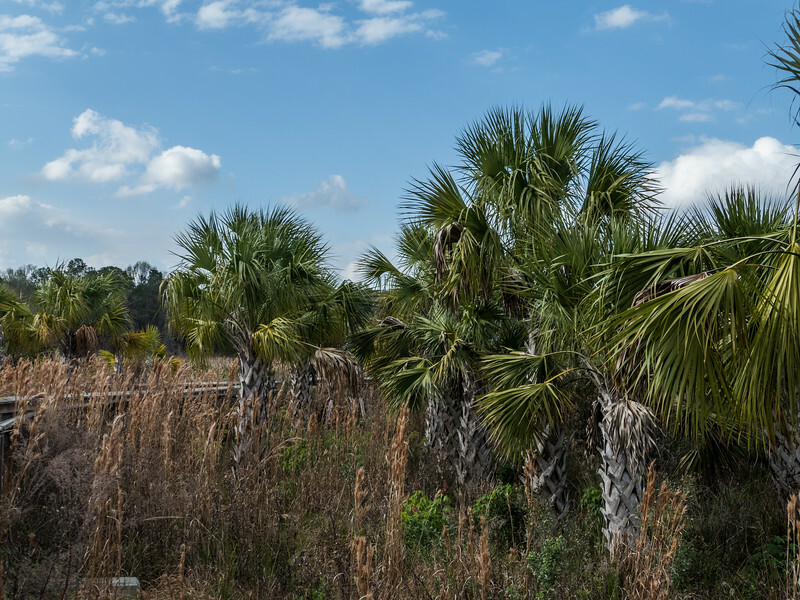 We were in a part of Florida with small towns, and they no doubt had Urgent Care facilities, but we were also just 18 miles from Ocala, where there was a trauma emergency care facility at the Ocala Regional Medical Center. It was our day to move to Oleno State Park, and the night before we had laughed at our “big” move of just 70 miles northeast. On this morning we were quite happy that the move was a short one because it gave us enough time to make a side trip to the emergency room in Ocala. Now, when I tell this silly story, please don’t roll your eyes. Yes, I realized later that I should have parked the rig in the lot and unhooked the car to take Mo to the hospital, but with the stress of doing everything and trying to get us there, I didn’t even think of that option. In fairness, unhooking the car with one person can be done, but I am not as good at that as Mo is, and Mo was basically incapacitated. Instead, we navigated our way to Ocala and the emergency room. This isn’t a small feat, since Ocala Regional is right near the center of town, and has small streets all around it. I managed OK with my remembered visits to the hospital when my friend Bel was here in 2013, but what I hadn’t counted on was all the construction going on. It was a huge mess, and I am driving the MoHo and the car, and as I try to get to the emergency door, I am waved off by men with flags telling me to back up. I CAN”T BACK UP, PEOPLE, I AM PULLING A CAR! The security cops wave me on, and then another guy tells me to go park in the parking garage. WHAT? I am 11 feet tall and I am pulling a car?! I can’t do that. Another guy comes up, a very nice guy, and tells me to just go around, make a u turn, and he will have a wheel chair waiting for Mo when I come back through. By the time I get down to where I am supposed to make a u turn, another bunch of guys tells me I absolutely cannot return back up the one way street that the other guy told me to follow. Another guy tells me to go in the parking garage. Ok then. I managed to find my way out of the orange netting maze to the street, and made my way back to the emergency entrance. Here we go again!!! But this time, the nice security guy and another security woman were ready for us, and they let me park long enough to get Mo into the wheelchair and whisk her away. Then it was just a matter of parking. I knew that about half a mile away was the Popeye Chicken with a nice big parking lot, so headed out of the maze and in that direction. As I turned onto some of the more narrow streets near the hospital, I passed a large Catholic Church and a Knights of Columbus facility with a huge parking lot. Seeing many open, unused double parking spaces, I quickly turned in and parked the rig! Whew! Turns out there was a pathway across the storm water drainage area and some stairs that led back to the hospital, and after getting Mattie settled in with all the fans running for the hot day, I headed back over to Emergency. We were only there about 3 hours, and both of us were impressed with the intake procedure, the care Mo received, and the amount of time it took for us to get through the whole process. Mo’s knee was X-rayed, and after some time we received the go ahead that there was no bone injury or break. 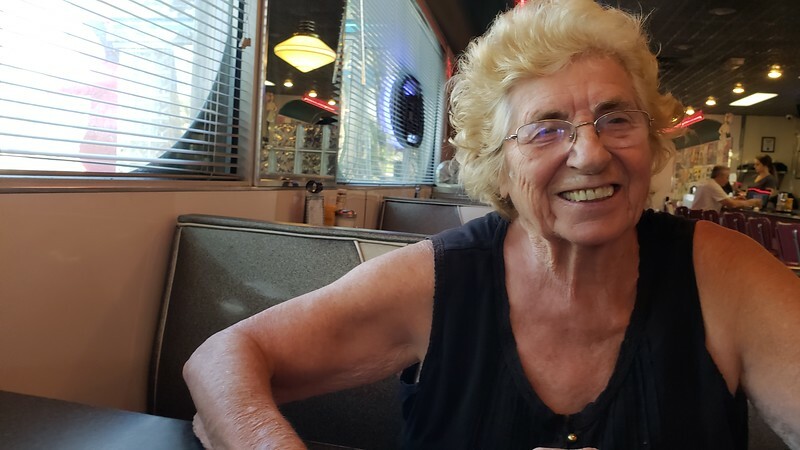 That didn’t help much, though, because the doctor said she would need an MRI to determine if there was any damage to cartilage, meniscus, or other knee parts. The problem with this, however, is that you need a primary care doctor to order the MRI! What?? He suggested that we return home to get that taken care of. Ok then, it is only about 3200 miles back to home, and we weren’t ready to give up on our winter plans just yet. He said, in lieu of an MRI, we could just do a “wait and see” kind of thing, and he provided Mo with an immobilization device to keep her leg straight out and stiff. Imagine for a moment if you can, trying to sit in an RV bathroom with a long straight immovable leg. It would have been funny if Mo hadn’t been hurting so badly. No pain meds were offered, and none were requested, but I did think it interesting that they didn’t even ask. Lots of Advil, and after 24 hours, no more cold but heat was the recommendation. Ok then. Everyone at the hospital was really nice, and wonderfully helpful. As I was walking mid visit back to the rig to check on the dog and be sure the fans were keeping her cool, the security captain asked where I was going. I told him our story and he said, “Have them call the captain when your friend is ready to go. I will take care of it.” He did just that, and when Mo was released, we wheeled her out the door to the waiting shuttle cart driven by the captain, who then drove us all the way to the waiting MoHo. Pretty darn good service, I would say. Mo was still hurting and terribly uncomfortable, but for now we had done all that could be done and would just have to wait it out to see if her knee healed up on its own and if it would get better or worse. As the days have passed, Mo’s knee is still swollen and not working well, and the pain is moving around to muscles and tendons rather than the knee. We have no idea what that means, and with getting an MRI requiring such complexity, aren’t exactly sure what to do next. Mo is still taking Advil, and hobbling about as best she can, but of course there are no long walks, or even very many short walks on our agenda. 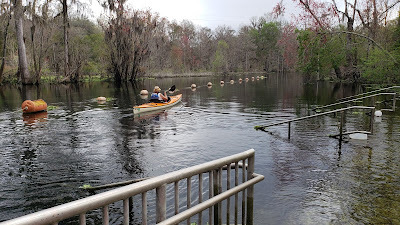 The good news is that she managed to get into her kayak yesterday, (Saturday the 23rd), and was able to sit long enough to paddle both up and down the Ichetucknee River. Sitting sometimes is the hardest, with strange muscle cramps that ensue if she sits too long. 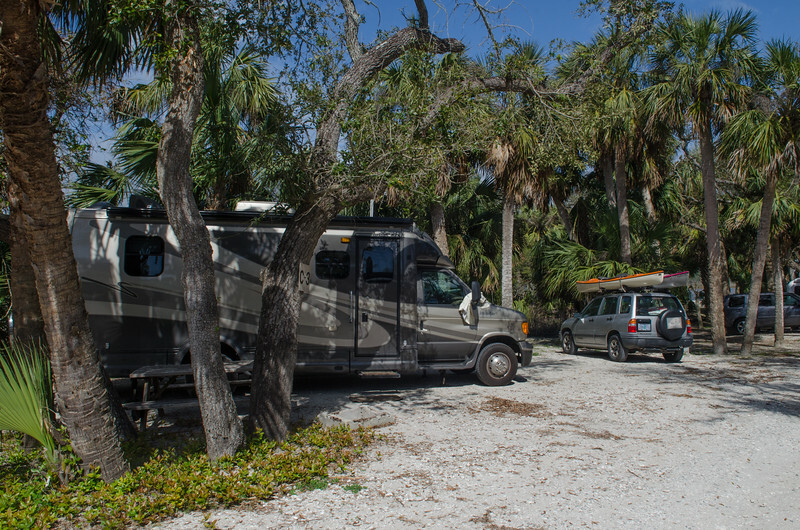 Our week at Oleno State Park ends today and we will continue east toward Jacksonville and the Mayport Naval Station tomorrow morning. 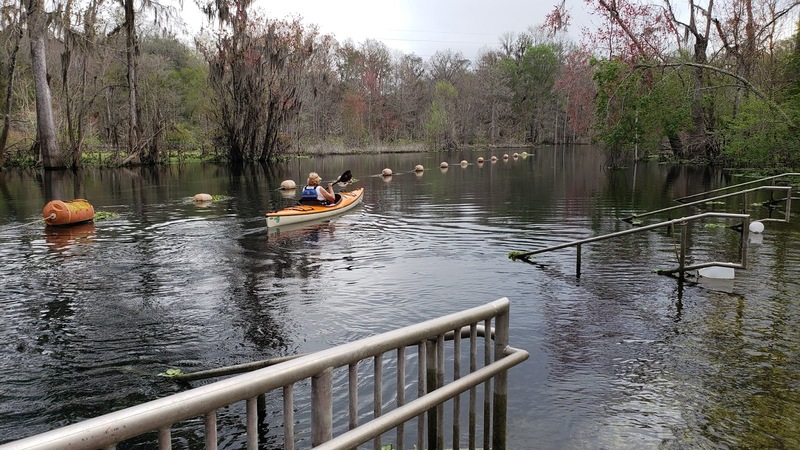 Now that the knee explanation is taken care of, I can take a bit of time to write about some of the lovely parts of where we have been this week, including a beautiful wetland preserve in Gainesville, the trails and history here at Oleno, and of course, our kayak on the Ichetucknee River.